Theater was always a popular entertainment in Cheyenne, however the venues that existed prior to 1881 were tacky, to say the least. One Denver newspaper disdainfully reported that one theater was located above a livery stable, so the sound of braying mules often disturbed the performances. So even though Cheyenne was located on a major railroad, the nicer venues remained too small to draw the top-tier performers that passed by on the rails. Cheyenne had no shortage of wealthy, sophisticated citizens who were used to attending legitimate theater, concerts and opera while visiting the East on business or family matters. A group of these civic-minded businessmen got together and agreed to raise $15,000 among themselves, with none of their contributions to exceed $1,000. The goal was quickly reached, and a local contractor and a local architect were engaged. F.E. Warren sold the group a lot at the corner of Seventeenth and Hill, a block north of the InterOcean Hotel. Brick was quarried locally and the decorative woodwork was done by local craftsmen. It was to be a true community project and it eventually cost $50,000 to build. An opera house lent a certain civilized atmosphere and sense of stability to a community which helped to spur other local construction projects do at the time the opera house was constructed Cheyenne experienced a construction boom. The new Presbyterian Church went up, as did numerous new residences and brick business buildings. An opera house, in a city with a population of 4,000, was not expected to generate nightly income, so a multi-use facility was planned. Sixty percent of the building was designated for the opera house and the remaining forty percent, facing Seventeenth Street, would house the Territorial Library and a commercial rental on the first floor. The second floor provided a theater balcony as well as a library hall, banquet hall and kitchen. The performance hall itself would accommodate 860 – 1,000 people. Upon completion, a gala inaugural ball and banquet were held to celebrate the opening. Tickets were ten dollars and the very finest of Cheyenne’s society attended. The Cheyenne Leader reported that Mrs. F.E. Warren wore white silk, and oriental cashmere, trimmed with Spanish lace, and diamond ornaments. Dance music was provided by the Third Cavalry string orchestra and carriages began arriving at nine. The dancing continued until midnight after which everyone went into the banquet hall for a “magnificent supper.” Dancing continued afterward. On May 25, 1882 the first opera came to town. Those attending came, not only from Cheyenne, but from Denver, Laramie and other surrounding communities. The Leader again gushed over the elegance of those who attended, as well as the 52-light chandelier with a gas reflector above. Red silk plush upholstery, carved woodwork and stained glass cathedral windows graced the establishment. A grand stairway of ash and black walnut lead to the balcony. As if this were not elegant enough, the stage had Corinthian-Doric columns and the drop curtain portrayed Roman chariot races (a natural for Cheyenne, right?). It had every accoutrement a theatre required and the acoustics were said to be excellent. The opera house opened up new opportunities for Cheyenne’s population to see the biggest stars of the day — Edwin Booth, Sarah Bernhardt, and Lillie Langtry among them. Minstrel shows were always popular and vaudeville came into vogue but in ten years Cheyenne’s population had tripled and the building was getting tattered around the edges. F.E. Warren, who had bought up the majority of the stock in the building, sold it to the Careys who had plans for an expensive remodel. As it turned out, however, commercial and office space was then at a premium the Careys chose not to invest in the remodel. As time went on less prominent people began to attend the events which then included commencements, local theatre and concerts. 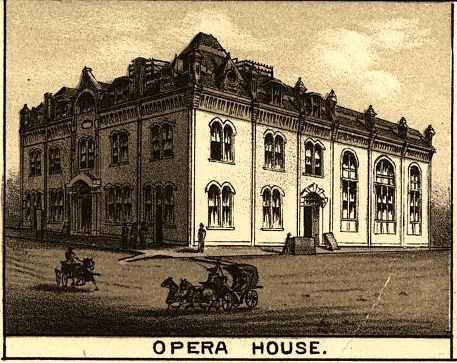 The opera house served as a cultural center for Cheyenne for twenty years before the location was finally converted to commercial use. Photo from Wyoming Tales and Trails. One of the interesting characters in Cheyenne history is Harry Hynds. He was born in 1860 and arrived in Cheyenne in 1882 at the age of nineteen. Harry was a blacksmith and he found a job working for Herman Haas, an established blacksmith and wagon maker. 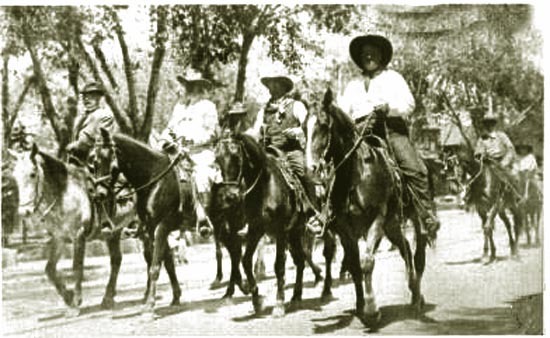 Harry also drove for the Cheyenne-Black Hills stage, taking over the route between Magic City and Fort Laramie. In 1883, he went into business on his own and took over the blacksmith work for the stage line. The stage was discontinued in 1887. When not working, Harry enjoyed saloon life. He was a gambler and a drinker who had a temper when he drank. Consequently, Harry got into fights. As a blacksmith he had a well-developed body even though he was only five foot eight inches tall. Soon he was prizefighting in Laramie and in Denver where large bets were placed and he won a substantial amount of money. After only two bouts, Harry quit fighting and opened the Capitol Saloon in Cheyenne. It was so lucrative that he added locations in Laramie, Rawlins, Rock Springs, and Salt Lake City. His other investments included mining, oil and the Plains Hotel. He moved into Cheyenne’s polite society circles…traveling extensively, and using his money for charitable purposes. He met and married a beautiful woman, Maude, who often traveled with him. In 1894 Harry and Maude moved to Salt Lake City. As one might expect, Harry divorced Maude. He then moved back to Cheyenne where he was more popular than ever. He invested heavily in the community and became one of its leading philanthropists. By the time Harry died in 1933 he had amassed a fortune of well over a million dollars. He had remarried and left a widow, Nel. In December of 1916, The Inter Ocean Hotel, one of the most well-known hotels in the west at that time, was extensively damaged by fire. The City demanded the building be razed. Senator F.E. Warren owned the property and in 1917 he sold it to Harry Hynds for construction of a five story office building. The building opened in 1920 and its design was advanced for its time. The building’s structure was of steel, there were no interior or exterior supporting walls and there was no wood used. 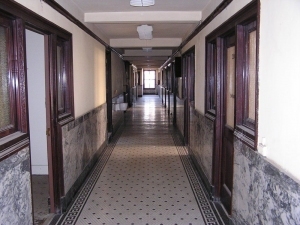 Floors were of mosaic tile, corridor walls were of green or gray marble, and the ground floor transoms were of stained glass. The exterior was covered in cream colored terracotta tiles and light wells were incorporated into the plan so that interior offices would have natural light. The building still stands at the corner of Lincolnway and Capitol Avenue. Since it is a damp, foggy “Jack the Ripper” kind of day outside I decided this might be a good time to relate stories of hauntings in Cheyenne. One of the most well-known sites in Cheyenne is St. Mark’s Episcopal Church at 1908 Central Avenue. When the church opened in 1888 the bell tower was still not complete and it had been capped off. It remained that way until it was completed in 1924. Two Swedish workmen were hired to complete the tower. However, when it reached the height of forty feet, both workmen disappeared. New craftsmen were engaged and they reported hearing strange noises; tapping, the sound of hammers and whispering which seemed to be coming from the walls of the tower. Years later, someone finally stepped up to the plate and reported that one of the original masons slipped and fell to his death. The other man feared he would be deported so he entombed the dead man in the tower wall and fled the area. Legend has it that the pipe organ that was once located in the tower can still be heard years after its removal. Some have reported the church bells ringing on their own and others say that the whispers can still be heard in the tower. The Plains Hotel was a luxurious new hotel back in 1911 and it is also said to be haunted. As the story goes, a newly wedded couple checked into the hotel and the bride caught the groom with another women. Ooopsie. After killing her husband and the other woman, the bride shot herself as well. It’s said that all three haunt the premises. Francis E. Warren Air Force Base is said to be the sight of many paranormal occurrences. It was first established as Fort D.A. Russell in 1867 as an army outpost, to protect workers building the Union Pacific Railroad across the frontier. It became a large cavalry installation providing backup to regional forts and protection for early surveyors, building of the telegraph system and stage lines. Today it is the oldest continuously active installation in the Air Force. It is now home to the 90th Space Wing and is one of four strategic missile bases in the U.S. Many lovely historic homes and structures remain on the base. Even now there are many tales of sighting old cavalry soldiers roaming the old dormitories and grounds. 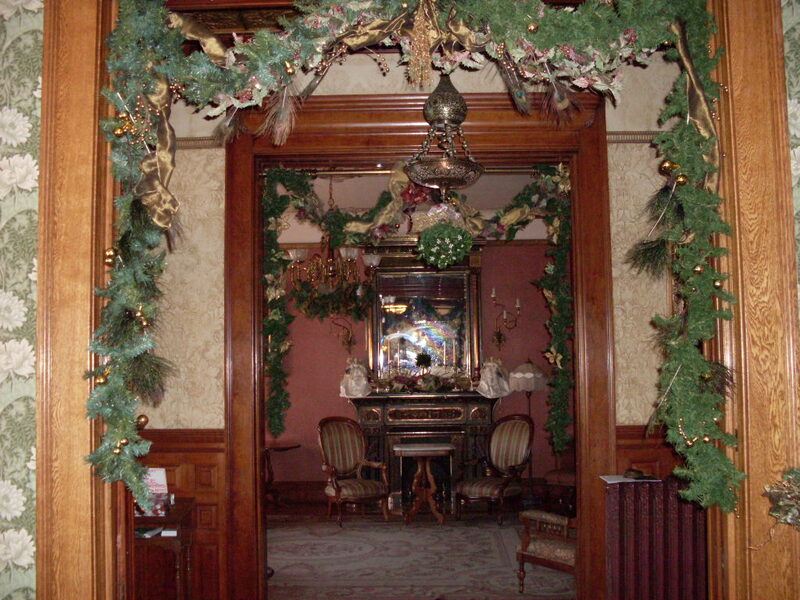 Residents of many of the old officers’ homes report paranormal activities and speak of phantom pets or people who share their homes with them. There is another tale of an Indian woman who roams Crow Creek and can be heard wailing in the night. Civilians are not allowed on base except during public tours or unless they are sponsored by military personnel. The best time to visit is during Fort D.A. Russell Days when there are guided tours of the gracious old homes as well as historical military re-enactments. Today we are moving from the sitting room to the parlor. This is my favorite spot to stand because all the swags reflect in the mirror above the fireplace mantle. Some people prefer standing under the kissing ball.